In a previous blog entry, I wrote how the creeping fig in our old house became too invasive and left unsightly marks on the wall. I was sort of hoping that the dried up aerial roots would eventually be washed away by the rains or blown by the wind. Sadly, neither happened and I'm left with no recourse but to scrape them off. Here's the detail on how the scraper is able to remove the stubborn aerial roots even in tight corners. 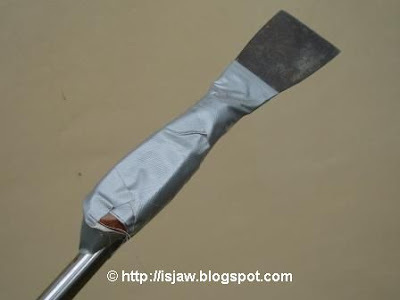 For this job, I devised this long handled scraper by binding a spatula to a long rod using duct tape. I cut a long piece of duct tape and wrapped the spatula to the end of the rod, leaving the blade of the spatula exposed. The danger with this job is the falling debris as the dried aerial roots get scraped off. So exercise proper precaution. As shown below, wear safety goggles to keep debris from falling into the eyes and wear a hat since the debris can get into the hair. Use a ladder to reach the topmost areas. Be careful when working at the top rungs of the ladder and ensure the ladder is safely secured to the ground and wall. 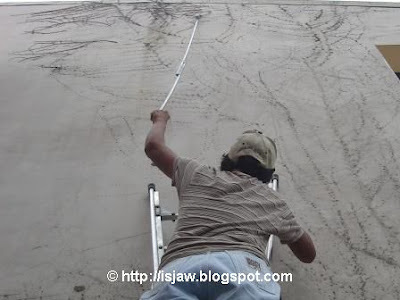 Have an assistant hold the rod and secure the ladder while climbing. Once positioned up on the ladder, the assistant could pass the rod to you. For the truly hard to remove roots, use a toothed paint scraper as shown below.